RMC (now CEMEX) – BARRINGTON CEMENT WORKS & QUARRY, Cambs. 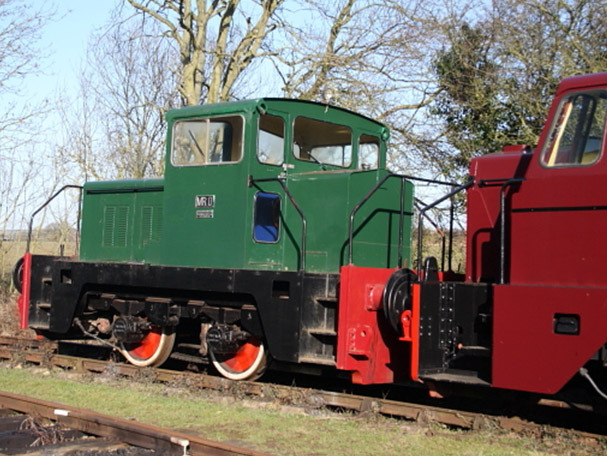 This popular diesel hydraulic locomotive was supplied on the 22nd August 1967 as a simple workaday shunter for use in the cement industry. After long service at Barrington and other works the loco hauled the last load of material out of Barrington Quarry, the last standard gauge quarry working in Britain – a small commemorative plaque to that effect is carried by the loco. To reflect the significance, the owners RMC donated the loco to our Museum where an overhaul and restoration was carried out. The loco now sports nameplates referring to John Drayton MBE, the railway & works manager at Barrington who championed the quarry railway system long after others had converted to road haulage and who has been entirely supportive of our project to preserve that heritage. MR.D is fully operational and is our regular service shunting loco.